Schematic diagram of rotary disk laser levitated above the magnet. Inset: Photograph of maglev system. The thermal load accumulated in the gain medium induces thermal lensing which results in thermal aberration to the laser cavity, which would degrade the performance of solid state lasers. When the gain medium is rotated, the heat accumulation can be shifted laterally such that the disturbance to the laser performance is minimized. Diamagnetic materials such as pyrolytic graphite (PG) have negative magnetic susceptibility. When exposed to an external magnetic field, the diamagnetic material generates an internal magnetic field in the opposite direction, implying that it can be levitated above the external magnetic field at room temperature. Under the illumination of a laser beam, the magnetic susceptibility of the diamagnetic material changes and subsequently the local temperature variation enables the rotation of the levitated diamagnetic material with high stability and precision. 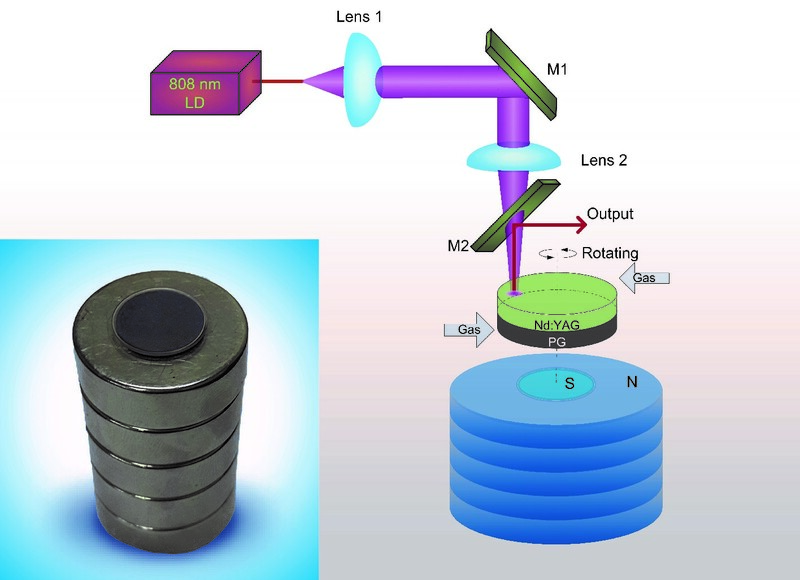 In their proof-of-concept investigation, a thin-disk Nd:YAG laser crystal was attached to a PG plate, and was levitated above a stack of permanent magnets. The pump irradiation from a fiber-coupled laser diode was absorbed by the laser crystal and its residual power was utilized to activate the rotation of PG plate. The levitated compound comprising the laser crystal and the PG disk was heavy, therefore the compressed gas was used to assist the rotation. In the experiment, a single-mode output of 17.7 mW was obtained from this compound, and the initial results verified the validity of the proposed laser scheme. According to the authors, this study proposed a new rotary laser scheme for power scaling and generation of a high brightness beam. "In the future, with further optimization to laser gain media and diamagnetic materials, maglev and optically-driven rotating disk laser will be more realizable, and it may bring in breakthroughs in high-power solid-state laser and planar waveguide laser," said Prof. Jianlang Li. The following work will be focused on reducing the weight of the maglev compound by the planar waveguide structure deposited on thin diamagnetic materials, and building maglev and rotary disk laser which is driven only by unabsorbed pump light.